The people of the planet Koturia are unique among all the sentient species of the universe in several respects. Physically, they resemble the people of Earth, save that Koturians' natural hair colors tends toward bright, neon tones. Koturians are also one of the few species - apart from Time Lords - capable of total physical regeneration, though they only regenerate once and their regenerations are triggered by intense feelings of love rather than severe stress or injury. As such, weddings are serious business on Koturia and Lord Ervis Makshi is all too pleased when The Doctor and his companion Peri show up on Koturia just in time for the wedding of his son Jonos. Jonos is getting on in years and fast approaching the point where he will no longer be able to regenerate and the family is so happy for Jonos they are able to overlook scandalous little details like his bride-to-be not being a Koturian. But there is something mysterious about Jonos's intended Lania... and there are few mysteries that The Doctor can leave unsolved. 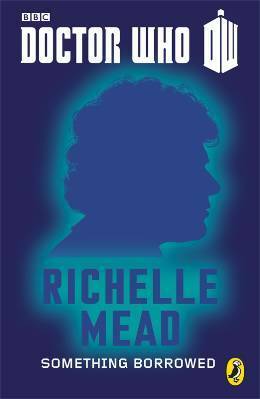 Richelle Mead succeeds in something few of the writers in the 11 Doctors: 11 Stories collection even attempted and creates a new species with an interesting culture as the background for Something Borrowed. Described as Las Vegas in space (but with much more serious weddings), Koturia is a tangible reality to the point of being a character in and of itself. This helps to make Something Borrowed a bit more interesting than the Earth-bound stories from earlier in the collection. Another thing that separates this story from the rest of the collection is the fact that this is the only tale told from a first-person perspective. Peri is our narrator and Mead does a fine job of capturing her voice, with Peri snarkily taking The Doctor down a peg when his pompous-side flares up. Given that this is a Sixth Doctor story, that occurs quite often and Mead does a good job of capturing the essence of Colin Baker's performance. This story is worth giving a shot for the difference in perspective alone. An interesting villain also livens up the proceedings. All in all, this story will be a pleasure for most anyone who reads it.